A typical dinner these days when I’m at home looks like this: simple and vegetarian. 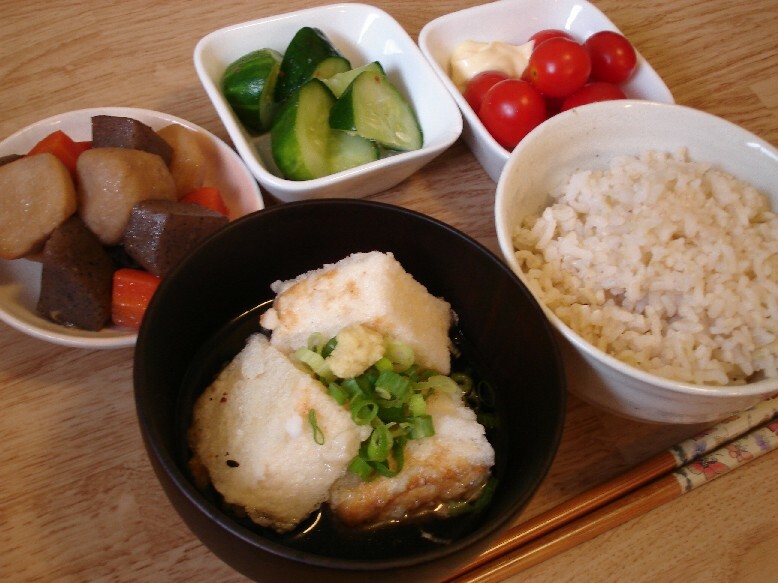 Tonight I had agedashi tofu, nimono, pickled cucumbers and grape tomatoes. Agedashi Tofu is really quite easy to make. Cut tofu into blocks, coat lightly with corn starch, and deep fry in oil. Top with green onions and grated ginger and serve with hot dashi sauce. For the dashi, you can simply dilute some bottled somen sauce. Of course this meal would not satisfy my carnivorous hubby, so I make the nimono with big chunks of chicken and serve it all to him.